1964 Summer Olympics Venues, Tokyo. From the wiki: “Tokyo was selected in 1936 to host the 1940 Summer Olympics, but had to withdraw its hosting duties upon Japan’s second invasion of China in the following year. 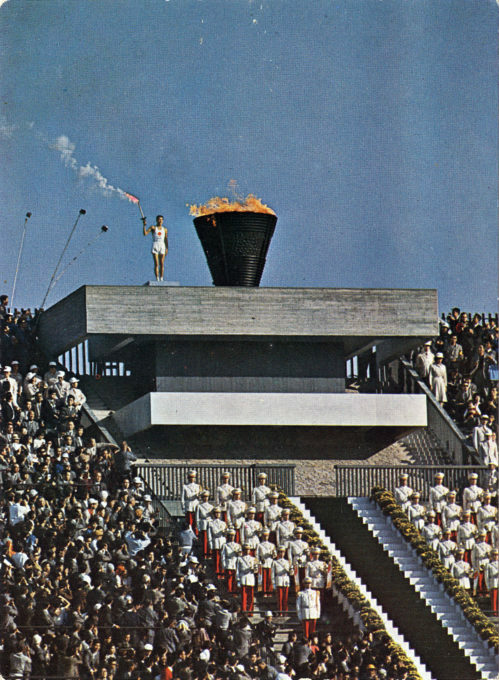 This led the organizing committee to abandon organizing the 1940 Games altogether in 1938 with them being awarded to Helsinki though the Finnish city would abandon the 1940 Games themselves in the wake of World War II. 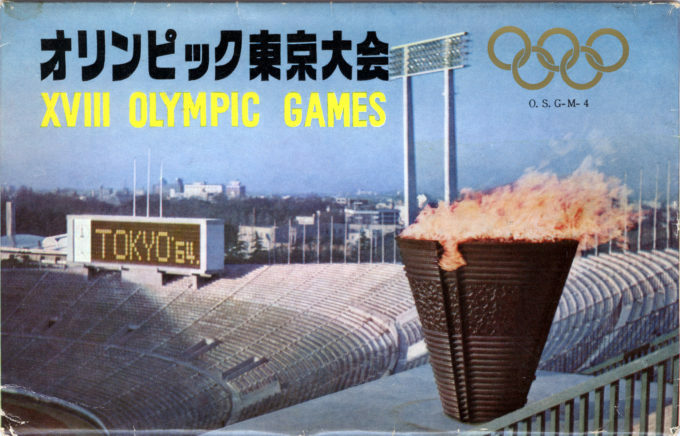 Cover of postcard pack, 18th Olympic Games, Tokyo, 1964. “Anchorman Yoshinori Sakai holds aloft the Olympic torch as he set abalze the cauldron”, Tokyo, 1964. Yoyogi National Gymnasium, Tokyo Olympics, 1964, designed by Kenzo Tange, and built between 1961 and 1964 to house swimming and diving events in the 1964 Summer Olympics. A separate, smaller annex of similarly-designed was used for the basketball competition at those same games. On the periphery of the stadium grounds can be seen units from the former Washington Heights US military housing base that would be used as the Olympic Village by athletes during the 1964 Summer Olympics. 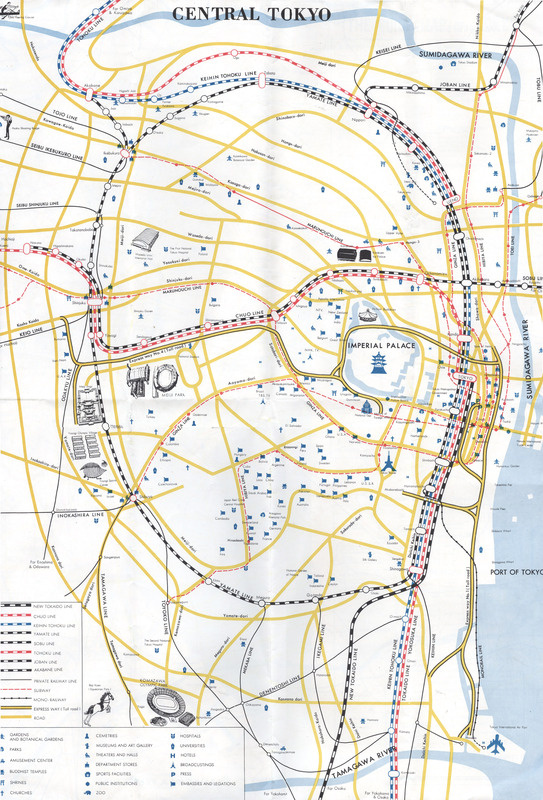 Tokyo tourist map, 1964. With Olympic venue locations. 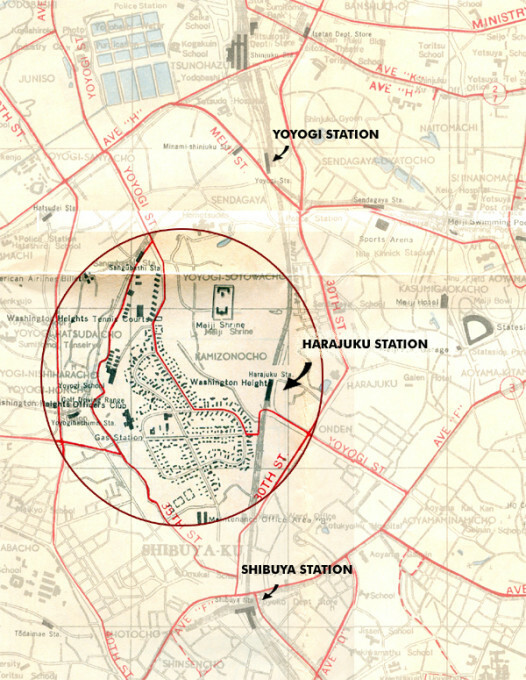 Map: Washington Heights military housing location (1946-1962), relative to Yoyogi and Shibuya stations and Meiji Shrine, c. 1949. The Yoyogi Olympic complex was built on the grounds of the former US military housing estate called Washington Heights. The area had formerly been used as a parade ground by the Imperial Japanese Army. After Japan’s surrender in 1945, the Occupation forces ordered the construction of the Washington Heights complex by the Japanese government for use by the US military. Housing totaled 827 units for United States Army Air Force and, later, Air Force personnel and their families. 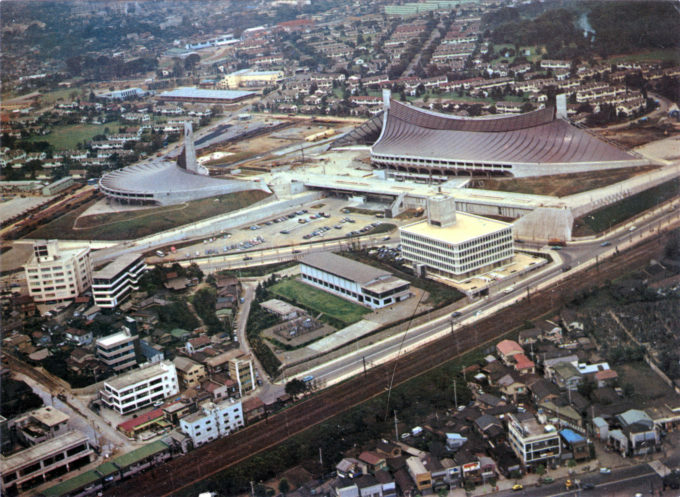 The US maintained control of it after the signing of the Treaty of San Francisco (1952) until it was determined that the grounds were needed for construction of the Yoyogi Olympic complex. During the Games, a number of the family housing barracks were used as athlete housing (seen on the periphery of the stadiums above). After the Olympics, the remainder of the Washington Heights housing was razed – with the exception of one house (that had been used by the Dutch Olympic team). It remains standing today in Yoyogi Park as an 1964 Summer Games memorial. 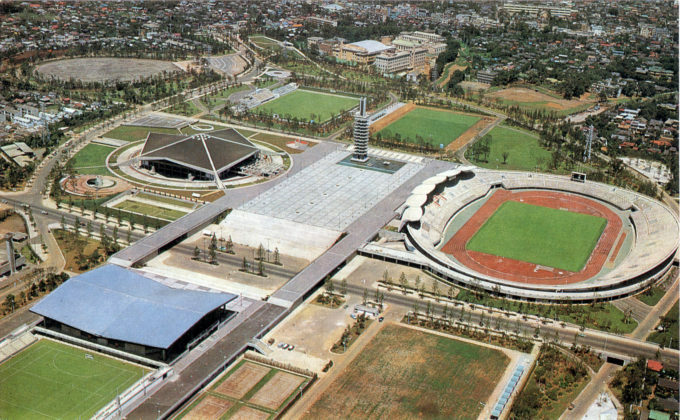 Yoyogi Olympic stadiums, Yoyogi, 1964. The National Gymnasium (right) was used for swimming and diving competition, while the Annex (left) was the basketball venue. 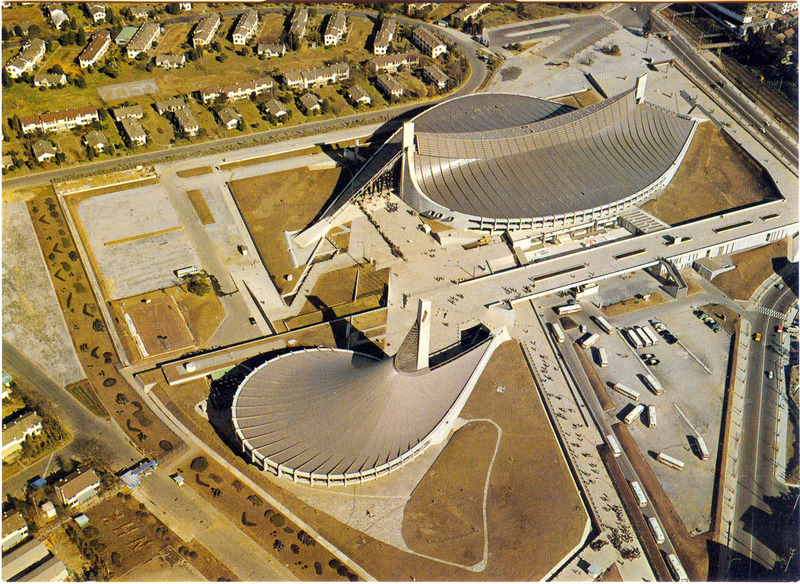 Both buildings were designed by Kenzo Tange. 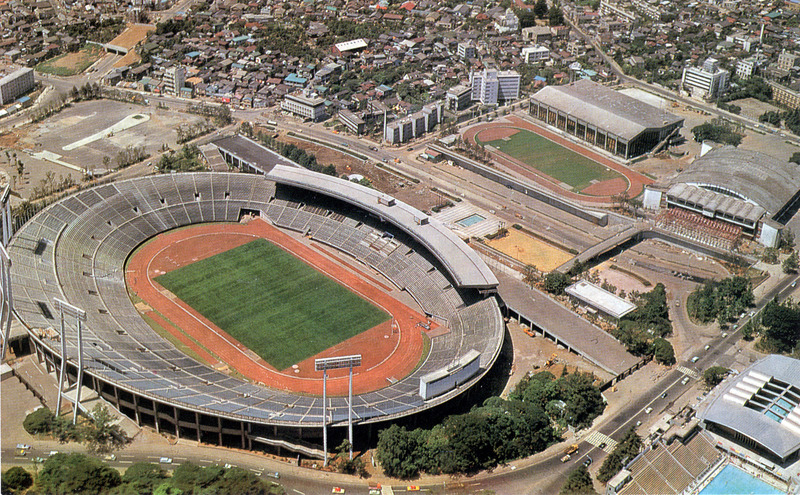 Aerial view of stadiums and Olympic Village, Yoyogi, 1964. In the distance can be seen the former Washington Heights housing, used by athletes during the Tokyo Olympics. Komazawa Olympic Park (below), straddling the western Tokyo suburban wards of Meguro and Setagaya, includes an outdoor athletic and soccer venue, the Komazawa Olympic Park Stadium, the Komazawa Gymnasium and multiple additional soccer, baseball, swimming, tennis, jogging and cycling facilities – along with the landmark Control Tower, that features as a focal point of the park – all designed by Japanese architect Yoshinobu Ashihara. The gymnasium venue hosted the wrestling events at the 1964 Summer Olympics. Three field hockey fields were also built, marking the first time field hockey was played at one single Olympic venue since the 1920 Games. Komazawa Olympic Park, c. 1964. National Stadium (below) is a stadium Meiji Shrine Outer Garden on the site of the former Meiji Field. The new stadium served as the venue for the Olympic Games opening and closing ceremonies, as well as being the venue for track and field events. 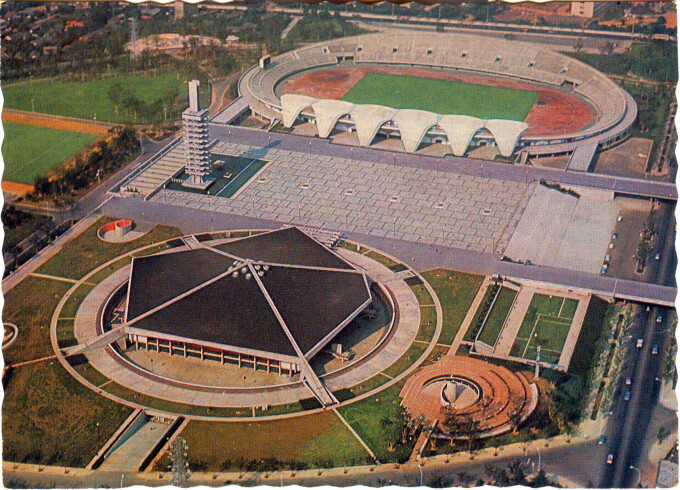 The stadium was completed in 1958. Its first major hosting event was the 1958 Asian Games. 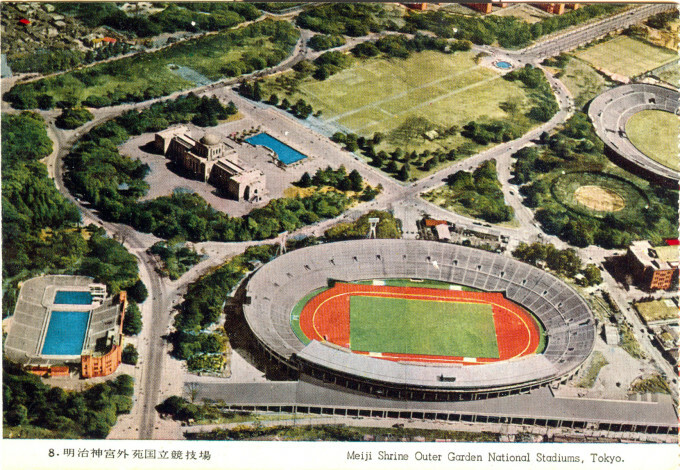 National Stadium, Meiji Outer Garden, c. 1964. 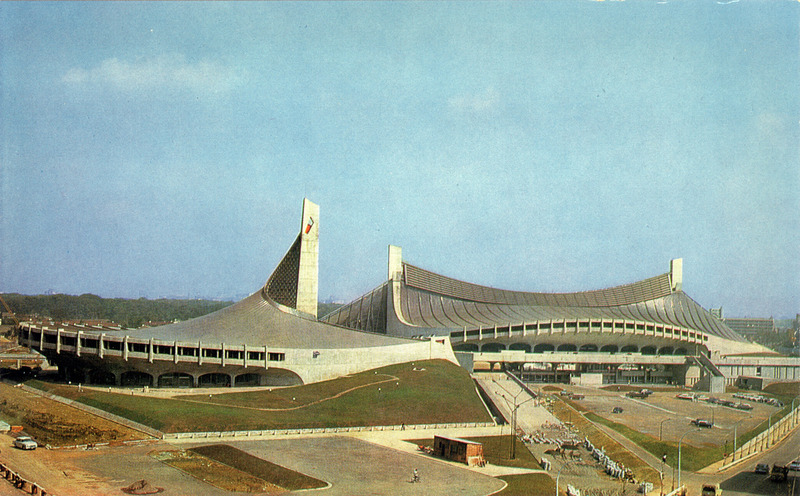 National Stadium, Meiji Outer Garden, 1964. 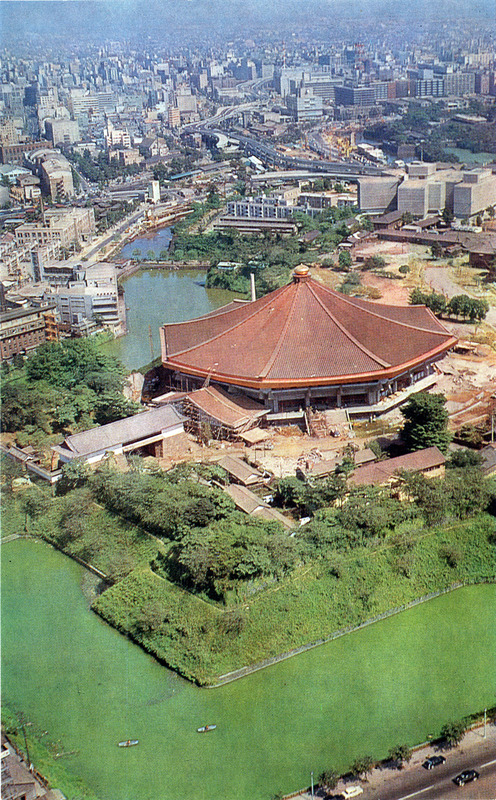 Budokan, Tokyo, 1964, under construction. The Nippon Budokan was constructed for Judo competition in the 1964 Summer Olympics; hence its name, which translates in English to “martial arts hall”. It has since gone on to become well-known as the location where many “Live at the Budokan” albums were recorded, including those of Bob Dylan, Cheap Trick, Dream Theater and Ozzy Osbourne. The Beatles were the first rock group to perform at Budokan, and their appearances were met with opposition from those who felt the appearance of a Western pop group defiled the martial arts arena. The Nippon Budokan is located in Kitanomaru Park in the center of Tokyo, on the north fringe of the Imperial Palace grounds near Yasukuni Shrine. The imposing octagonal structure holds 14,471 people, and was modeled after Yumedono (Hall of Dreams) in Hōryū-ji Shrine in Nara. The National Memorial Service for War Dead is held annually on August 15, the day of Japan’s surrender, with the Prime Minister, the Emperor and the Empress in attendance. 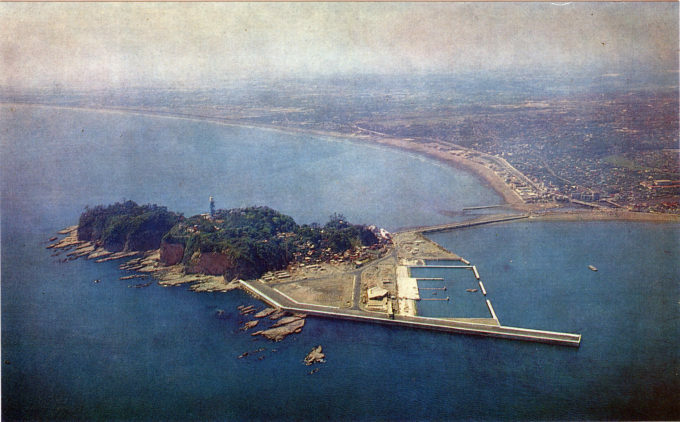 Olympic yacht harbor at Enoshima, 1964.